Things around us are always evolving, which often results in businesses playing catch up. But what if you could adopt habits that would let you stay ahead of the curve by embracing and exploiting disruption to your own processes? 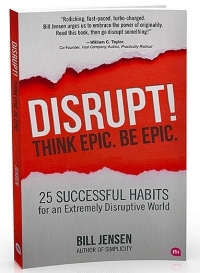 In this issue of The Pulse, we examine the latest book by management consultant and author Bill Jensen, Disrupt! Think Epic. Be Epic., which gives us tips on how to get ahead in an extremely disruptive world.